A very approachable version of the French classic white bean and meat stew… Make-Ahead Pressure Cooker Cassoulet is warming, comforting, and has all the flavors of the traditional. Use a pressure-cooker to speed up the process, and freeze a portion for a quick and delicious meal later! I have something of an obsession for good and healthy food. I don’t enjoy many of the local eateries, and fast food is “a fate worse than death” for this girl. In recent months, I have spent some of my time in the kitchen working on recipes that freeze well, and allow me quick options when there is no time to cook. This cassoulet does take a bit of time to prepare, but portioning the beans and meat stew prior to baking in a casserole makes it perfect for a fresh meal or two at a later date. I promise you it won’t resemble leftovers! Cassoulet originated in the south of France, and is named after its traditional cooking vessel – the cassole – a deep, heavy earthenware pot. It had its humble start as a peasant dish of dried beans, sausages, and preserved meats. In contemporary society, French cassoulet chefs may argue fanatically about what cassoulet is – and isn’t – as though it is haute cuisine. Some prefer goose, others duck, still others rabbit… Argue as they may, it is a delicious though humble peasant dish. Duck confit is a traditional ingredient which is now considered to be a luxury ingredient and not widely available. Its inclusion was more a matter of necessity due to lack of refrigeration. Duck, rabbit, and goose may have been cheap and widely available to French farmers in medieval times, but in Las Cruces, New Mexico they are not. If I may be so bold, I would suggest that the combination of slow cooking the meats with the beans is what “makes magic” in this dish. I have used different combinations of sausages, pork, chicken, smoked turkey leg, bacon, etc. – all with delicious results. My Make-Ahead Cassoulet starts with mirepoix – the combination of chopped onion, celery, and carrots used to flavor many dishes – and of course garlic and olive oil. Always fat and calorie conscious, I slow cook (or pressure cook) the beans with a smoked turkey leg. Sausage is a must, and any good quality garlicky sausage will work. I love the flavor of chorizo or linguiςa, but even a kielbasa or smoked sausage will do. Lastly, I include boneless chicken (breast or thigh) and/or boneless lean pork, and a generous handful of herbs like fresh rosemary and thyme. In summary, the process (in my kitchen) goes like this: I pressure-cook my white beans with a smoked turkey leg, a 6″ sprig of fresh rosemary, and 2 bay leaves for 45 minutes – until the beans are almost tender and the meat comes easily off the bone. While the beans cook, I prep the other ingredients. After the pressure-cooker is de-pressurized, I remove the turkey leg and allow it to cool. The mirepoix and garlic go into the pot first, followed by raw meat (chicken, pork, duck), the sausage (chorizo, linguiςa, kielbasa), and finally, the beans, smoked turkey, tomatoes, and herbs. Simmer together for 30 minutes. 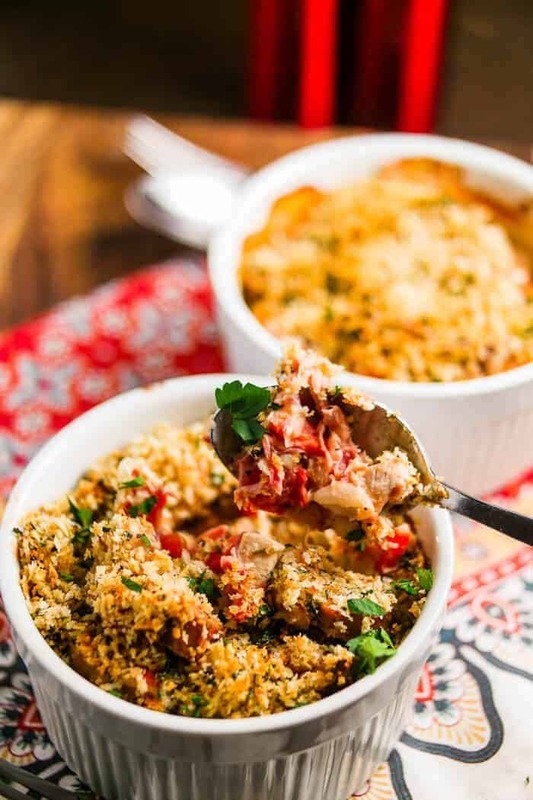 At this point, you can prepare the crumbs and cook the entire dish, or you can make individual casseroles as shown in the photo and freeze the rest. Use whatever combination of meats appeal to you, and enjoy! A very approachable version of the French classic white bean and meat stew... Use a pressure-cooker to speed up the process, and freeze a portion for a quick and delicious meal later! Combine first 5 ingredients in pressure cooker. Fill with water to about 2/3. Pressurize on high. Lower heat to maintain pressure. Cook about 30 minutes. While beans and smoked turkey cook, start the stew. To a large dutch oven, add olive oil, onion, celery, and carrots. Stir over medium high heat 2-3 minutes. Add garlic. Lower heat if necessary; don't burn the garlic! Add raw meat. Cook until edges are browned. Add sausage, and continue to cook until fragrant. De-glaze the pot with the white wine, cooking until nearly evaporated. Add tomatoes. Give the pot a good stir. Lower heat to a very slow simmer, and cover the pot. De-pressurize pressure cooker according to manufacturer's instructions. Remove turkey leg, and set aside to cool. Pull from the bone, chop, and add to the stew. Remove bay leaves and stem from the rosemary. Using a spider or slotted spoon, add beans to the stew. Reserve the liquid to add as needed to the stew. Stir the stew to combine all ingredients. Using a ladle, add additional cooking liquid to the stew. You don't want a soup, but it should be nice and moist - about 2 cups. Simmer together 30 minutes. Add additional liquid if the stew appears to be dry. While the stew simmers, make your bread crumbs. I allow about 1/4 cup of bread crumbs per serving, and that works out to about 1 slice of bread. I only make enough crumbs for immediate use. You could make enough for the entire batch, and freeze what you don't use for later. Add slices of bread to a food processor bowl, and pulse a few times. Add a few leaves of parsley for each serving. Since I make 2 servings at a time, I would add a handful of parsley to the bowl. Pulse until you have coarse crumbs combined with the parsley. Add a drizzle of olive oil to a saute pan. Add the crumbs. Stir with a wooden spoon until crumbs are just lightly coated and begin to brown. Bake in oven pre-heated to 350 degrees - 30 to 40 minutes for individual ramekins, or up to 60 minutes for a single casserole dish. The crumbs should be browned but not darkened, and the stew should be bubbling. Before serving, top with additional finely chopped parsley if desired. If you decide in favor of canned beans, you will need about 3 cans of beans - rinsed and drained. I would suggest using a few slices of bacon to get the smoky flavor. Fry it until fat is rendered and it begins to crisp. Remove and chop the bacon to add with the beans. Drain most of the fat from the pot before making the mirepoix. Do not add olive oil. If you don't have a pressure cooker, you can cook the beans and smoked turkey in a slow-cooker all day, or on the stove for 2 to 2 1/2 hours. Remember, you want the beans tender, not soft. Pressure cooking does require a bit of "trial and error." Pre-soaked beans cook more quickly. If you want the turkey leg meat super tender, you may wish to pressurize it first for 20-30 minutes, then add the beans and pressurize another 30 minutes. Don't throw away any of the cooking liquid. It's delicious! If cooking the entire stew at once, I would suggest using a heavy dutch oven on the stove that can be transferred to the oven for baking. 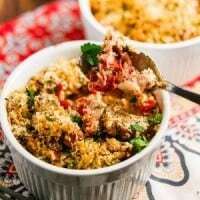 For more on cassoulet, I found this article How to Make Traditional Cassoulet (And Why You Should Put Chicken in It!) from Serious Eats to be informative and interesting. For more on cooking beans in a pressure-cooker, I found this article How To Cook Beans In a Pressure Cooker to be helpful. Left over cassoulet, spread (mashed) on a slice of toasted rye bread, covered with grated Swiss cheese and broiled until cheese is toasty makes a great lunch! thanks for the recipe! could you clarify how to freeze and reheat? do you freeze with the bread crumbs on, then thaw and bake, or do you put the bread crumbs on after it is thawed but before you bake? Hi Jenny! Thanks for asking this important question... I put the cassoulet (without seasoned crumbs) in a zip bag or two. After thawing, I spoon it into individual ramekins, and make a fresh batch of seasoned bread crumbs. I hope that clarifies, and I'm sorry if it wasn't clear! Oh my goodness, you have gone above and beyond with this cassoulet! I am pinning this, I am married to someone who is half French, now I have an idea of what to make when my Father in Law comes over, thank you for the education! Thanks Sara! I hope your father-in-law enjoys it if you do make it for him! Make Ahead?? That's my name. 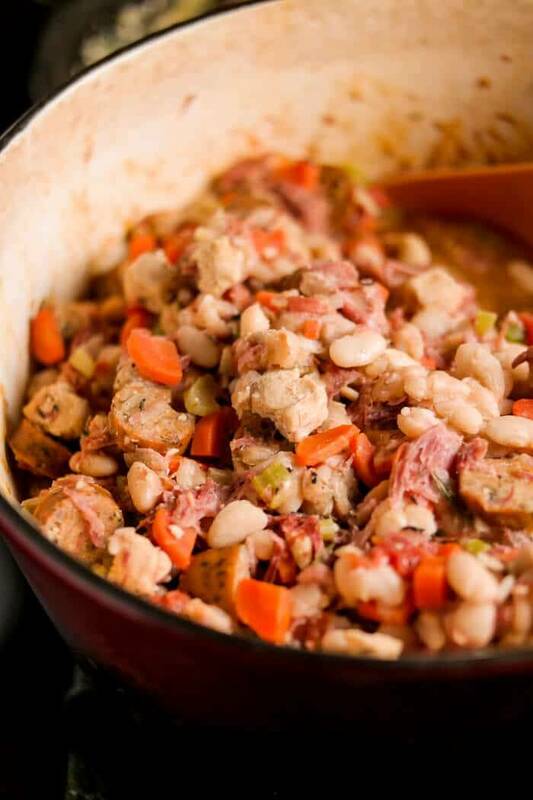 Your cassoulet looks delicious and I love the idea of getting a jump start on dinner. It looks so warm and comforting. Great recipe! This has comfort dish written all over it. YUMMO, I love that you can make it ahead! it looks like there's some work with it, but also looks sooo worth it! It is definitely worth it if you are able to freeze half for a second meal! Your Cassoulet looks delicious! I love that it's a make-ahead recipe, too! Thanks Jillian! I love to have some go-to dishes in the freezer for quick and easy meals. Yay! What combination of meats did you use? I love freezing leftovers for a second meal, but with Papa there, that may not have happened... ;-) I'm so glad you like it, thanks for letting me know!